In 1927 and 1928, the physicists R. Luther and N. D. Nyberg published two scientific works in which they described new developments “from the area of colorimetry and chromatic stimulus” and commented on “the construction of the colour-solid within the context of all light sensations”. Their interest was centred on the figure or “solid” which would be revealed through accommodation of the tangible, material colour pigments within a theoretical construction called a colour-space, and they were eventually able to provide a new spacial order for the diversity which colours possess. To the outsider, the method used in the compilation of the system and its supporting structure is as baffling and confused as it is beautiful. We encounter the mathematical world of colorimetry for the first time — a world where colours are characterised by numbers and their mutual relationships are made measurable. To be more exact, we are faced with the measurement of colour stimulus. Colour stimulus is understood to be the radiation which enters the eye and is absorbed there. Using three parameters, colorimetry experts can draw upon many possibilities when specifying the three dimensions (similar to the geometrical factors of height, length and width defining the material space in which we move) which are used to define the boundaries of a so-called colour-space. 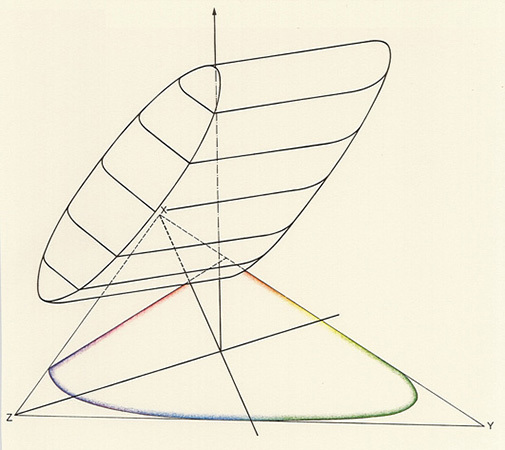 The dimensions employed by Luther and Nyberg use two “colour-moments” to define the plane above which the body rises in the left-hand colour-solid, together with the relative brightness value L, which is perpendicular to this plane. The relative brightness value shows the brightness of a non-self-luminous colour as the eye will value it. This will always be in comparison to the brightness of other bodies seen simultaneously. Colour-moments characterise the different types of pigment and coloured materials in a way which can be technically verified. 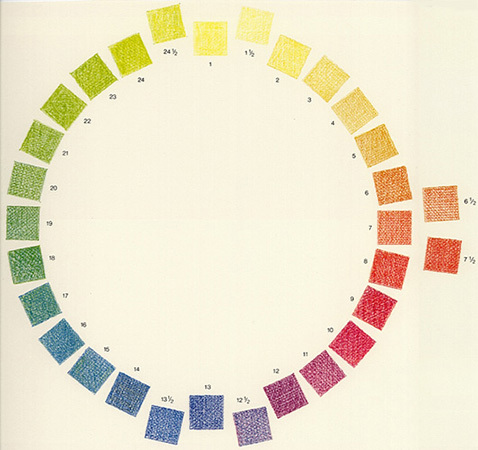 Luther and Nyberg return to Ostwald’s colour-circle, which is constructed with eight full colours (expressed by Ostwald as: yellow, orange, red, violet, ultramarine, turquoise, seagreen and leaf green) from which 24 colour-hues will later arise. 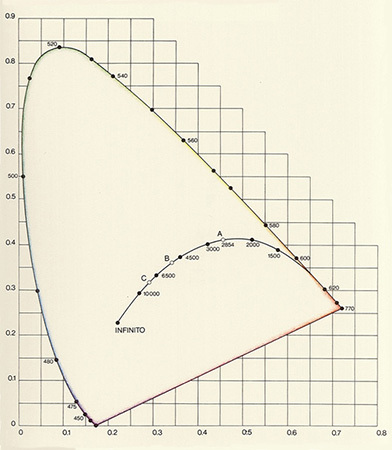 In Luther and Nyberg’s colour-solid, the full colours assume the position as suggested by the curved line Y-G-B-P: namely, yellow-green-blue-purple. In addition, the concept of optimal colour is exploited (defined as being the brightest possible non-self-luminous colour of a specified coloured pigment or material). 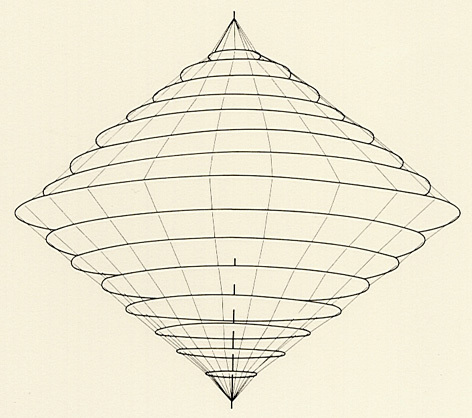 We can imagine the left-hand illustration as a reconstruction of Ostwald’s double-cone, the only component still recognisable being the connecting line between the white and black points (W, BK) on which all the grey tones lie. The surface of this pigment colour-solid is formed by the full range of optimal colours. With a given colour-hue and brightness, the optimal colour possesses the maximum saturation; with a given hue and saturation, the optimal colour will have the greatest brightness. Since colour-hue and saturation together determine the stimulus-type, and since vectors for the same stimulus-type within the colour-space are parallel, the optimal colour-vector can be distinguished from vectors of the same stimulus type by its maximum length. It will, acordingly, always reach the surface of the colour-solid. 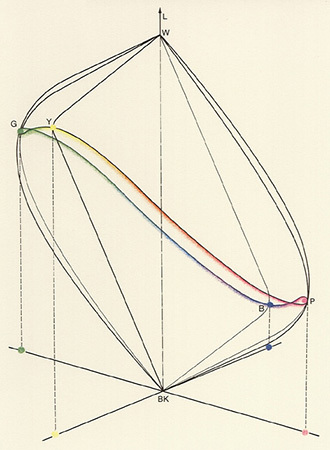 The exact — albeit rather unsymmetrical — design of the Luther and Lyberg colour-solid has been constructed according to a relatively demanding series of formulae in line with the criteria of stimulus colorimetry. Results can be plotted according to units of brightness or stimulus. The figure is based on units of stimulus, with brightness being given priority in the right-hand figure; for the right-hand figure, a slightly more abstract portrayal has been selected whereby the Luther-Nyberg solid is suspended above a triangle defined by the lines between X, Y and Z, inside of which the CIE curve has been drawn. The decisive coordinates are the straight lines (colour-moments) which bisect two corners of the triangle (at X and W) and intersect at right-angles. The lines drawn through the solid (named “height layers”) depict the positions where the optimal colours have the same relative brightness values. There is no need to master all the technical details in order to enjoy the shape of this colour-solid. Nevertheless, it does offer the expert an additional advantage, in that the optimal colours accentuated and effective within this colour-solid permit a convenient theoretical approach to the problems of either colour photography or four-colour printing. In fact, although the accuracy offered may necessitate a high degree of mathematical or geometrical complexity, the effort involved will be rewarded since the Luther-Nyberg colour-solid is the colorimetrically equivalent shape of many other colour-solids which have been conceived empirically — in other words, according to the subjectivity of the eye. It is amusing to think that just when the two physicists were attempting to replace the subjective element in the construction of colour-solids with objective criteria, their colleagues were being compelled to make a radical change in the way they viewed atoms: in the mid-twenties, it was becoming ever more obvious that the influence of the observer, even in the exactness of physics, could no longer be ignored and that a subjective component was unavoidable. The dualism discovered by Einstein with regard to light demanded an understanding of light as both a wave formation and particles to the extent that the observer (the subject) can choose for himself between these two aspects and how he wishes to see the object of his investigation. At a higher level, objectivity can still remain, as philosopher-physicists were quick to realise. The spectre of subjectivity has since lost some its horror: in the traditional sense, science can never be entirely objective — ultimately it is a human construction. Science will always have subjective aspects. When they predominate, as with colours, we can simply find that lovely. Date: The two physicists Luther and Nyberg evolved their colour-solids in 1927 and 1928 respectively, during the course of their work on the measurement of colour stimulus. Form: Colour-solid constructed around the vertical black-white axis. Bibliography: R. Luther, «Aus dem Gebiet der Farbreizmetrik», Zeitschrift für technische Physik 8, pp. 540-558 (1927); N. D. Nyberg, «Zum Aufbau des Farbenkörpers im Raum aller Lichtempfindungen», Zeitschrift für Physik 52, pp. 406-410 (1928); M. Richter, «Einführung in die Farbmetrik», Berlin 1976.